This eco-friendly drive is made from bamboo. It features a large printable area for maximum exposure, with a slender profile. 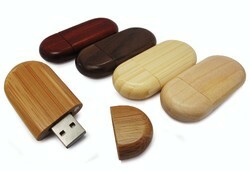 Featuring sleek rounded edges, and a removable magnetic cap. Front & Back: 1 1/8" x 3/4"